Here is a feat of engineering which isn't talked about much. The Belfast Roof was an ingenious lattice system, developed around 1860. The trusses have a curved top, and could span huge distances with no need for any vertical supports like pillars inside. These meant that large open-plan buildings - like aircraft hangars - were much easier to build and work in. Aside from being structurally clever these were visually beautiful. Some pics below gathered up from various websites. It would be good to see these reintroduced to our local architecture. Earlier this year I had the privilege to work with Nigel Boullier to put together a truly groundbreaking publication of his collection of over 30 years of music, photographs, stories, biographies and dances from the part of County Down where we both live. The outcome is the 544 page Handed Down - Country Fiddling and Dancing in East and Central Down, published by the Ulster Historical Foundation. It covers over 200 years of living tradition, of community, of a world which predates and defies the 'two tribes' stereotypical approach to Ulster life. Nigel writes with authority, through years of study and research but because he is a fiddle player himself and is writing about his own folk, people who have influenced him throughout his life - and in turn of the people who influenced them, all the way back to the late 1700s. Handed Down is a colossal achievement on many levels, succeeding in being both intimate and yet scholarly. Whilst my task was mainly to make it all fit within our page quota I hope that the design approach helps to get the story across. It contains 500 fiddle tunes, 30 dances and biographies of 300 fiddle players. It begins with a detailed overview of the origins of music and dance in County Down and, to me, a refreshing summary of the politics which have done such damage to folk tradition - on the one hand through appropriation by Irish Nationalism, and on the other hand just outright neglect and abandonment by Ulster Unionism. Traditional music is seen in our generation as the preserve of 'one community'. Handed Down shows that it is in fact a common inheritance, one which our ancestors truly shared. As Nigel knows, at times it was a tough design process, but the painstaking effort that we both applied to it over many months has really paid off. We got on like a house on fire and a Waltons Mountain badge lives to tell the tale (that's an in-joke for Nigel!). Further photographs to be posted soon. 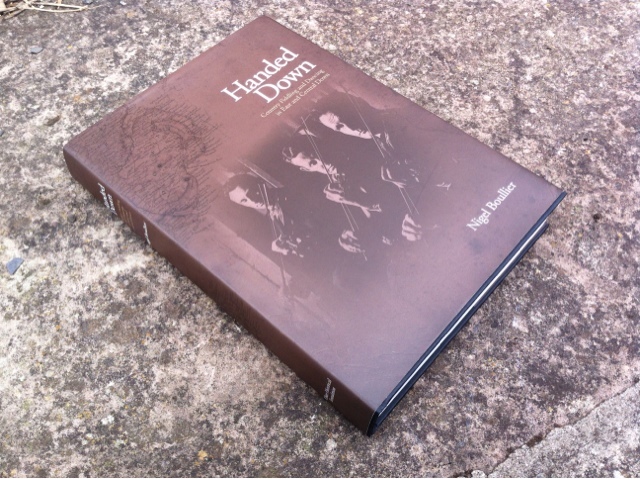 Handed Down - Country Fiddling and Dancing in East and Central Down is available here priced at £24.99. "Whit way wud ye like yer egg this mornin John?" "Hmph. Alang wi anither yin".